The Female Clothing store has released the first batch of summer clothes for this year! We have 2 new Pixie Pets - the Chibs and Fasoro. Theres also a new Skater Crindol and Skater Huthiq. Marapets reached an amazing 2 Million Players today! We do have lots of fun things planned to celebrate, but we honestly didn't expect to reach this many registered members until August, so we'll start our celebrations soon enough! Thank you so much for everyone who has helped us become what we are today, and make sure you make good use of our Referral System so we can start celebreating 3 million members really soon! 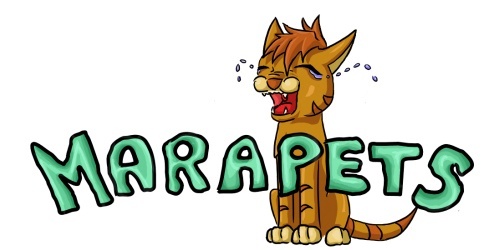 Our first EVER marapets logo. We changed it by the time we reached 250,000 players. Our second logo... which we changed when we wondered why we made the Chibs cry while its promoting Marapets! A lot more of you may remember the Quell banner. It stayed with us right up to when we celebrated 1 million players! The Lottery has been drawn for this week. soulchickjnr152 is the winner of the 652,600MP Jackpot with the winning numbers of 10, 5, 19, 12, 2 and 8! Congratulations! Last Week's Raffle has now ended. rose97553 is the winner of the Red DNA and 100,000MP prize with the winning raffle ticket number 37718! Congratulations! Make sure you buy your tickets for today's raffle - only 10MP per ticket! The annual Undying Festival has just started in Undying Woods. With 60 clues for you to solve, each revealing a new letter and 12 of them giving out a prize! Here are some of the great prizes you can get through solving the clues.. When you have completed all 60 levels of the Undying Festival, you will have 60 different letters. You will need to use them to solve the following sentence. If you do solve it, you will be able to change one of your pets into a Daisy, you will receive 100,000MP and you will also find the Undying Festival Avatar! You can get either a Snookle Potion or a Renat/Newth potion. Its a 50-50 chance which one you will get. There is a new pearl, cd, stamp and book for each theme. This is the Skater Newth and Pixie Renat avaliable with the new Pixie Costume or Skater Costume. And finally, there is a new Character Costume for the new pet. Enjoy! This weekend will be our Undying Festival. This is a brand new annual event which will happen every year, in July or August. You will have to follow our clues to find the letters we have hidden around the site. Along the way, you will find lots of new prizes, such as MP, BP, RP, Account Upgrade Credit and new rare items that will retire after the event. When you find every letter, you will then have to put them together as a sentence, which will then allow you to change one of your pets into this brand new limited edition Daisy pet if you want one. The event will start this weekend, and will last for 2-3 weeks. After this time, you will not be able to get a Daisy pet again until the event this time next year! This pet will only be avaliable from the annual Undying Festival in Undying Woods. There will also be a new avatar that will retire at the end of this event! There are 3 new Skeleton Pets avaliable. A new DNA Minipet has been discovered. You can now breed a Gonk with an Mordo to get a Gordo. There are 22 new Voodoo Dolls restocking in Eleka's Castle. These two new Avatars have been added to Trotter's mission. The Elite Gym has now been released in Lush Lake. 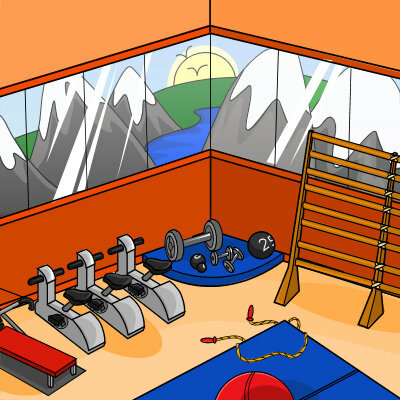 The Elite Gym is where you can pay to train your pets for the Olympic Games coming to Lush Lake this year. You can train in coordination, stamina and balance. All payments must be in diamonds. The training courses and rates for this fitness gym are in the table below. These stats will be important for the new Battle Arena and the Marapets Olympics. You can now use all of those Diamonds you've saved up! A new DNA Minipet has been discovered. You can now breed a Gonk with an Oglue to get a Goglue. The Lottery has been drawn for this week. 0zhen is the winner of the 1,070,800MP Jackpot with the winning numbers of 11, 1, 5, 12, 8 and 23! Congratulations! Last Week's Raffle has now ended. lavanya09 is the winner of the Red DNA and 100,000MP prize with the winning raffle ticket number 66151! Congratulations! Make sure you buy your tickets for today's raffle - only 10MP per ticket! A new Fasoro Character Costume has just been released that will only be avaliable as a limited edition upgrade item. If you would like to get one, hurry while stocks last! The July upgrade should be released some time next week. Can you find this Inside Out Avatar? We have just released the new Mission Game in Undying Woods. Trotter is a skeleton Zoink who lives alone in Undying Woods. Its really difficult for him to meet any new people and make new friends, because most pets in Undying Woods are dead. So he spends his life in front of his LCD tv, watching DVDs. Trotter has 30 different missions for you to complete. He will select one of the many dvds in Marada that he has watched before and you will need to show him that you have watched it with one of your pets... that way you will have something in common with Trotter and he can feel less lonely for once in his life! If you do, you will move on to the next level. If not, you will fail and will have to start again. Completing this mission will get you a limited edition Zoink pet! The Lottery has been drawn for this week. moondude419 is the winner of the 918,100MP Jackpot with the winning numbers of 19, 2, 15, 24, 6 and 20! Congratulations! Last Week's Raffle has now ended. record3299 is the winner of the Red DNA and 100,000MP prize with the winning raffle ticket number 41887! Congratulations! Make sure you buy your tickets for today's raffle - only 10MP per ticket! We have changed the way that Sunglasses now work. They are no longer one use items, but instead are added to your Wardrobe. Thanks the way we log everything that you do, all sunglasses you have used before today have now been added to you wardrobes. We also have 4 new male and 4 new female Sunglasses restocking! We have also added new Limited Edition Account Upgrade Items. There is a pair of male sunglasses, a pair of female sunglasses and an Inside Out Potato! A new DNA Minipet has been discovered. You can now breed a Yuni with an Ercuw to get a Erni. The new Zoink pet is now avaliable in 6 new colours. The new Undying Woods mission will be released next week! MARAUPLOADS is now back in service. You can use it to upload your images for FREE for your clubs, signatures, profiles and the new Marasites really soon. Those who bought extra upload space will also find that they can use it, plus the extra features you get with Uploads Upgrades! The Lottery has been drawn for this week. sugarfairy1 is the winner of the 1,006,400MP Jackpot with the winning numbers of 15, 5, 7, 19, 23 and 25! Congratulations! Last Week's Raffle has now ended. catherder is the winner of the Red DNA and 100,000MP prize with the winning raffle ticket number 27479! Congratulations! Make sure you buy your tickets for today's raffle - only 10MP per ticket! There are now two new Male Hair Styles and two new Female Hair Styles! The chances of getting a female haircut coupon from the Tombola has also been increased, because the prices for those has increased rapidly. Seems that theres more females and they change their hair styles more than the male players! This should lower the prices a little, and cut down on the number of females now using male dress up dolls. A new DNA Minipet has been discovered. You can now breed an Ercuw with a Renat to get a Renuw. The Lottery has been drawn for this week. spacejam12 is the winner of the 787,500MP Jackpot with the winning numbers of 9, 1, 2, 8, 6 and 4! Congratulations! Last Week's Raffle has now ended. ChildOfLucifer is the winner of the Red DNA and 100,000MP prize with the winning raffle ticket number 15374! Congratulations! Make sure you buy your tickets for today's raffle - only 10MP per ticket! A new DNA Minipet has been discovered. You can now breed a Crindol with a Feliz to get a Fendol. Can you find these two new Hidden Avatars? ?